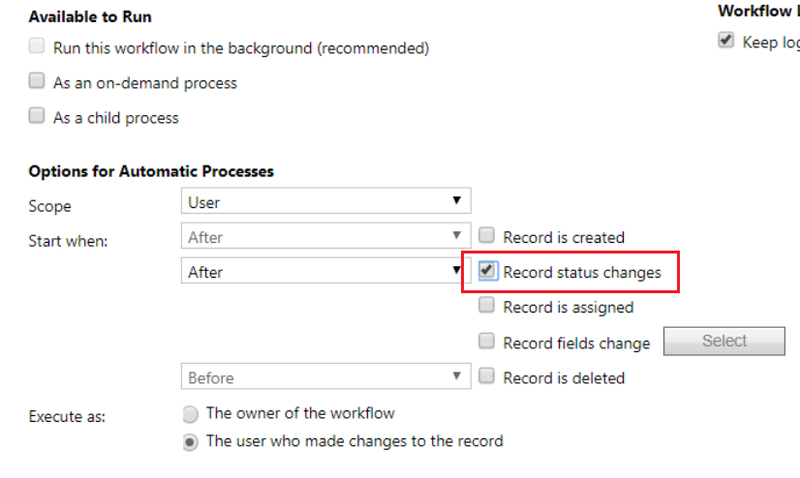 Does ‘Record status changes’ workflow trigger fire workflow on status change? A weird post title I know..
One of the most confusing things in CRM is the State and Status (or Status Reason) of a record. These two things are very different in CRM, and it seems that the CRM UI itself often gets mixed up between the two. When you create a new entity for example, the default label for the statecode field is Status, and for the statuscode field it is Status Reason. Exactly what does this mean? Will the workflow fire when the record’s State (Active/Inactive) changes? Or will it fire when the record’s Status (‘sub-state’ within Active/Inactive) changes? Will it fire on both? Well, as it turns out, this option will fire the workflow only when the record’s State changes. Enabling this option has the same effect as enabling the ‘record fields change‘ option and ticking the statecode field in the filter. Tick the ‘record fields change‘ option. This enables the Select button to apply field filtering. Now click the Select button. You will see that the statecode field is selected by default. Even though the option say ‘record status changes‘, it really means on record state (Active/Inactive) changes. Misunderstanding this option can cause workflows to fire (or not fire) unexpectedly in your system. 2 Responses to Does ‘Record status changes’ workflow trigger fire workflow on status change? Thank you!! You just saved me a whole lot of headache!